An international airport is an airport with customs and border control facilities enabling passengers to travel between countries. International airports are usually larger than domestic airports and often feature longer runways and facilities to accommodate the heavier aircraft commonly used for international and intercontinental travel. International airports often also host domestic flights. In August 1919, Hounslow Heath Aerodrome, in London, England was the first airport to operate scheduled international commercial services. It was closed and supplanted by Croydon Airport in March 1920. In the United States, Douglas Municipal Airport in Arizona became the first international airport of the Americas in 1928. The precursors to international airports were airfields or aerodromes. In the early days of international flights, there was limited infrastructure, "although if engine problems arose there were plenty of places where aircraft could land". Since four-engined land planes were unavailable for over-water operations to international destinations, flying boats became part of the solution. At the far end of the longest international route (which became the Kangaroo Route), on-water landing areas were found in places such as Surabaya and in the open sea off Kupang. 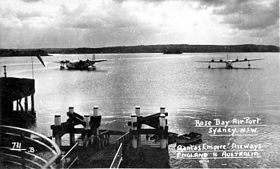 In Sydney, Rose Bay, New South Wales, was chosen as the flying boat landing area. International airports sometimes serve military as well as commercial purposes and their viability is also affected by technological developments. Canton Island Airport, for example, in the Phoenix Islands (Kiribati), after serving as a military airport during World War II, was used as a refuelling stop by commercial aircraft such as Qantas which stationed ground crew there in the late 1950s. The advent in the early 1960s of jet aircraft such as the Boeing 707 with the range to fly non-stop between Australia or New Zealand and Hawaii, meant that a mid-Pacific stop was no longer needed and the airport was closed to regular commercial use. Other international airports, such as Kai Tak Airport in Hong Kong, have been decommissioned and replaced when they reached capacity or technological advances rendered them inadequate. The construction and operation of an international airport depends on a complicated set of decisions that are affected by technology, politics, economics and geography as well as both local and international law. Designing an airport even for domestic traffic or as "non-hub" has, from the beginning, required extensive co-ordination between users and interested parties – architects, engineers, managers and staff all need to be involved. Airports may also be regarded as emblematic of national pride and so the design may be architecturally ambitious. An example is the planned New Mexico City international airport, intended to replace an airport that has reached capacity. Airports can be towered or non-towered, depending on air traffic density and available funds. Because of high capacity and busy airspace, many international airports have air traffic control located on site. Some international airports require construction of additional infrastructure outside of the airport, such as at the Hong Kong International Airport, which included the construction of a high-speed railway and automobile expressway to connect the airport to the urban areas of Hong Kong. Construction of the expressway included the construction of two bridges (the Tsing Ma suspension bridge and Kap Shui Mun cable bridge) and the Ma Wan viaduct on Ma Wan island to connect the bridges. Each bridge carries rail and automobile traffic. International airports have commercial relationships with and provide services to airlines and passengers from around the world. Many also serve as hubs, or places where non-direct flights may land and passengers may switch planes, while others serve primarily direct point-to-point flights. This affects airport design factors, including the number and placement of terminals as well as the flow of passengers and baggage between different areas of the airport. An airport specializing in point-to-point transit can have international and domestic terminals, each in their separate building equipped with separate baggage handling facilities. In a hub airport, however, spaces and services are shared. Airport management have to take into account a wide range of factors, among which are the performance of airlines, the technical requirements of aircraft, airport-airline relationships, services for travelling customers, security and environmental impacts. Technical standards for safety and operating procedures at international airports are set by international agreements. The International Air Transport Association (IATA), formed in 1945, is the association of the airline companies. The International Civil Aviation Organization (ICAO) is a body of the United Nations succeeding earlier international committees going back to 1903. These two organizations served to create regulations over airports which the airports themselves had no authority to debate. This eventually sparked an entire subject of air travel politics. In January 1948, 19 representatives from various US commercial airports met for the first time in New York City to seek resolution to common problems they each faced, which initiated the formation of the Airport Operators Council, which later became Airports Council International – North America (ACI-NA). This group included representatives from Baltimore, Boston, Chicago, Cleveland, Dallas, Denver, Detroit, Jacksonville, Kansas City, Los Angeles, Memphis, Miami, Minneapolis-St. Paul, New York-Newark, Philadelphia, Pittsburgh, St. Louis, San Francisco and Washington. International airports have extensive operations in managing flight logistics, such as air traffic control. The latter service is provided by ground-based controllers who coordinate and direct aircraft on the ground and through controlled airspace. Air traffic control also provides advisory services to aircraft in non-controlled airspace. Airports with international flights have customs and immigration facilities, which allow right of entry. These change over time but are generally designated by law. However, as some countries have agreements that allow connecting flights without customs and immigrations, such facilities do not define an international airport. The current trend of enhancing security at the cost of passenger and baggage handling efficiency at international airports is expected to continue in the future. This places financial burden on airports, risks the flow of servicing processes, and has implications for the privacy of passengers. International flights often require a higher level of physical security than do domestic airports, although in recent years, many countries have adopted the same level of security for both. Most international airports feature a "sterile lounge", an area after security checkpoints within which passengers are free to move without further security checks. This area can have services such as duty-free shops that sell goods that have been selected and screened with safety in mind, so that purchasing and bringing them on board flights poses no security risks. In addition to employees, only processed passengers with a valid ticket are allowed inside the sterile lounge. Admittance into the sterile area is done in centralized security checkpoints in contrast to e.g. individual checkpoints at each gate. This allows for more efficient processing of passengers with fewer staff, as well as makes it possible to detect both delays and security threats well ahead of boarding. To ensure the viability of airport operations, new and innovative security systems are being developed. For instance, the old security checkpoints can be replaced by a "total security area" encompassing an entire airport, coupled with automatic surveillance of passengers from the moment they enter the airport until they embark on a plane. Passengers connecting to domestic flights from an international flight generally must take their checked luggage through customs and re-check their luggage at the domestic airline counter, requiring extra time in the process. 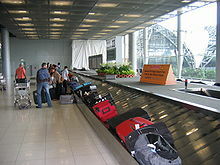 In some cases in Europe, luggage can be transferred to the final destination even if it is a domestic connection. In some cases, travelers and the aircraft can clear customs and immigration at the departure airport. An example of this would be that some airports in Canada, Ireland, and the United Kingdom, along with several other countries, have United States border preclearance facilities. This allows flights from those airports to fly into US airports that do not have customs and immigration facilities. Luggage from such flights can also be transferred to a final destination in the U.S. through the airport of entry. A crucial safety aspect of international airports is medical facilities and practices. In particular, controlling transmissible disease, such as SARS, is deemed important at international airports. While these standards are regulated by ICAO Standards And Recommended Practices (SARPs) and WHO's International Health Regulations (IHR), local authorities have considerable say in how they are implemented. Among the most important airport services are further transportation connections, including rail networks, taxi and shuttle services at curbside pick-up areas, and public buses. Large areas for automobile parking, often in co-located multi-storey car parks, are also typical to find at airports. Some airports provide shuttle services to parking garages for passengers and airport employees. Due to the very large scale of international airports, some have constructed shuttle services to transport passengers between terminals. Such systems operate for example, in Singapore Changi Airport and Zurich Airport. At some U.S. international airports, such as O'Hare International Airport in Chicago, some seating and waiting areas are located away from the terminal building, with passengers being shuttled to terminals. These areas may be referred to as ground transportation centers or intermodal centers. Amenities at ground transportation centers typically include restrooms and seating, and may also provide ticket counters, food and beverage sales and retail goods such as magazines. 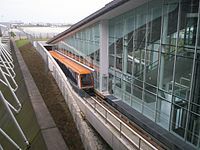 Some ground transportation centers have heating and air conditioning and covered boarding areas (to protect passengers from the elements). Standard amenities include public restrooms, passenger waiting areas and retail stores for dining and shopping, including duty-free shops. Dining establishments may be consolidated in food courts. Some international airports may offer retail sales of luxury goods at duty-free stores, such as at Terminal 3 at Indira Gandhi International Airport in India. This terminal has been described as having become a significant retail destination in India. Wi-Fi service and access, offices for bureau de change (currency exchange) and tourism advice are common, although the availability of service varies across airports. 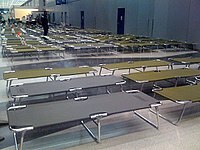 Some international airports provide secure areas for stranded passengers to rest and sleep. The more usual service is hotels that are available on the premises. The World Airport Awards are voted by consumers in an independent global customer satisfaction survey. Singapore Changi Airport has been the first-place winner in 2006, 2010, 2013 and 2014. Other winners include Incheon International Airport (South Korea) and Amsterdam Airport Schiphol (The Netherlands). Athletes such as Louisville Muhammad Ali International Airport named for boxer Muhammad Ali. Aviators such as pilots (civil and military) and others who played a role in the development of aviation. Sydney Airport is also known as Kingsford Smith Airport, named after Charles Kingsford Smith; and Comodoro Arturo Merino Benítez International Airport, in Chile, is named after Arturo Merino Benítez. Cultural leaders (poets, artists, writers, musicians) such as Leonardo da Vinci–Fiumicino Airport, named after Leonardo da Vinci; Liverpool John Lennon Airport, named after The Beatles member and Liverpool native John Lennon; Tom Jobim Airport, at Rio de Janeiro named after the composer Antonio Carlos Jobim; Louis Armstrong New Orleans International Airport, named for jazz musician Louis Armstrong; John Wayne Airport in Santa Ana, California, named for actor John Wayne; Bob Hope Airport in Burbank, California, named for comedian Bob Hope. Václav Havel Airport Prague, named after writer/philosopher/statesman Václav Havel. Budapest Ferenc Liszt International Airport and Warsaw Chopin Airport were both renamed after musicians, the former after Franz Liszt on the 200th anniversary of his birth and the latter after Frédéric Chopin. Ethnic groups, such as Minangkabau International Airport in Padang, Indonesia, named after the local Minangkabau people. Ideals in combination with toponyms, such as Newark Liberty International Airport. Mythology and religion, such as heroes of epics and myths, church hierarchs and saints and similar names. Manas International Airport (or Bishkek) in Kyrgyzstan is named after Manas in the Kyrgyz national epic poem. Politicians and statesmen, such as Heads of State, Members of parliament and leaders of political parties as well as high-ranking military personnel. Examples include: Paris-Charles de Gaulle Airport, named after Charles de Gaulle, John F. Kennedy International Airport (in New York City), named after John F. Kennedy, the 35th President of the U.S., Ronald Reagan Washington National Airport in Arlington, Virginia, named after Ronald Reagan, the 40th President of the U.S., George Bush Intercontinental Airport in Houston, named after George H. W. Bush, the 41st President of the U.S., and Soekarno-Hatta International Airport that serves Jakarta, Indonesia (named after Sukarno and Mohammad Hatta, who were the first president and vice president of Indonesia respectively, as well as the proclaimers of Indonesia's independence). Franz Josef Strauß Airport in Munich, is named after the famous Bavarian politician and co-founder of Airbus. There are two international airports named after Simón Bolívar, one in Venezuela, and one in Colombia; Netaji Subhas Chandra Bose International Airport, formerly known as Dum Dum Airport, is named after Subhas Chandra Bose and Montreal-Pierre Elliott Trudeau International Airport, named after former prime minister Pierre Elliott Trudeau. Public figures (advocates, engineers, doctors, teachers, journalists or sportspeople), such as George Best Belfast City Airport, named after footballer George Best, who came from the city. Royalty, such as King Fahd International Airport at Dammam, Chhatrapati Shivaji International Airport at Mumbai, Tribhuvan International Airport at Kathmandu are all named after royalty. Scientists such as Bologna Guglielmo Marconi Airport, named after Guglielmo Marconi and Belgrade Nikola Tesla Airport, named after Nikola Tesla. A study found that 44 percent of the world's international airports are named by toponyms: named for politicians (thirty percent), aviators (seven percent), mythology and religion (three percent), public figures (two percent), people of science (two percent) and other (one percent). Airports also use an IATA-3 letter code to abbreviate the names of all the international airports. 1919 (August) Hounslow Heath Aerodrome begins operating scheduled international commercial services from England to France. 1933 Douglas International Airport in Arizona is honored by Eleanor Roosevelt as "the first international airport of the Americas", having reached this capacity in 1928. As of 2012[update], Hartsfield Jackson Atlanta International had the greatest number of travelers of all international airports with a total of 95,462,867 passengers, 13.5 million more than the next busiest airport which was Beijing Capital International with 81,929,359 passengers. The following year, Hartsfield retained its place as the busiest airport but with only 94.4 million passengers. Los Angeles International Airport is considered to have the greatest number of passengers who start or end their travel there as opposed to continuing on to a connecting flight. Overall, LAX is considered to be the 7th busiest airport in the world. 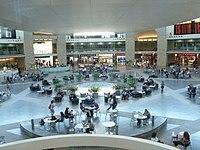 Dubai International Airport is the busiest airport in the world by international passenger traffic, with 83,105,798 international passengers. Dubai is the third busiest airport worldwide. Svalbard Airport in Svalbard, Norway is the northern-most airport to which tourists can book tickets. It is primarily used for transporting miners to and from a cluster of islands with a heavy mining industry. King Fahd International Airport, Dammam, Saudi Arabia is the largest airport in the world, encompassing over 300 square miles (780 km2). ^ Bluffield, Robert (2009). Imperial Airways: the birth of the British airline industry 1914–1940. Hersham [England]: Ian Allan. ISBN 978-1-906537-07-4. ^ a b Blaskey, Larry (6 June 2008). "Eleanor Roosevelt's trip to Douglas remembered". Douglas Dispatch. Retrieved 6 October 2014. ^ a b Stackhouse, John (1995). --from the dawn of aviation : The Qantas Story, 1920-1995. Double Bay, NSW: Focus Pub. pp. 57, 66–71. ISBN 1-875359-23-0. ^ Walker, Howell. "Air Age Brings Life to Canton Island". The National Geographic Magazine: January 1955, pp. 117-132. ^ Hafer, JR. "Kai Tak Airport Hong Kong". 20th Century Aviation Magazine. Retrieved 20 October 2014. ^ Feldman, Elliot J. and Jerome Milch (1982). Technology versus democracy: the comparative politics of international airports. Boston, Massachusetts: Auburn House Pub. Co. ISBN 0-86569-063-4. 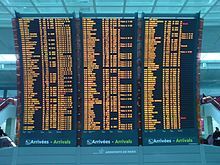 ^ Regulatory implications of the allocation of flight departure and arrival slots at international airports. Montreal, Canada: International Civil Aviation Organization. 2001. ^ Salter, Mark B. (2008). Politics at the airport ([Online-Ausg.] ed.). Minneapolis: University of Minnesota Press. ISBN 0-8166-5014-4. ^ "Planning and design of airport terminal building facilities at nonhub locations". United States Federal Aviation Administration. 1980. Retrieved 30 September 2014. ^ "Quality control of construction for airport grant projects". U.S. Dept. of Transportation, Federal Aviation Administration. 2007. Retrieved 1 October 2014. ^ Telford, Thomas (1 November 1998). "transport links". Hong Kong International Airport (Technical report). Supplement of Volume 126 (Special Issue 2 ed.). Journals Leon Heward-Mills for Institution of Civil Engineers. ^ Graham, Anne (2003). Managing airports – an international perspective (2 ed.). Oxford, UK and Burlington, US: Butterworth-Heinemann. ISBN 0-7506-5917-3. ^ "History of Airports Council International-North America". Airports Council International – North America. Retrieved 2 October 2014. ^ Reddy, Arun. "The Science and Technology of Air Traffic Control". Ars Technica. Conde Nast. Retrieved 3 October 2014. ^ Bennett, David L. (1996). "Designated US International airports". U.S. Department of Transportation Federal Aviation Administration. Retrieved 1 October 2014. ^ St. John, Peter (1991). Air piracy, airport security, and international terrorism: winning the war against hijackers. New York: Quorum Books. ISBN 0-89930-413-3. ^ Moore, Kenneth C. (1991). Airport, aircraft, and airline security (2nd ed.). Boston: Butterworth-Heinemann. ISBN 0-7506-9019-4. ^ Rodney Wallis (2003). How Safe are Our Skies? : Assessing the Airlines' Response to Terrorism. Greenwood Publishing Group. pp. 90–91. ISBN 978-0-275-97847-1. ^ IHR implementation at ports, airports and groundcrossings – video (WEBM). multimedia.who.int (Video). WHO. Retrieved 1 October 2014. ^ "FAQ: What are the ICAO Standards and Recommended Practices ... at international airports?". ICAO. Retrieved 1 October 2014. ^ a b c d e f Strategies for Improving Public Transportation Access to Large Airports. Transportation Research Board. 2002. pp. 81–84. ISBN 0-309-06764-2. ^ a b Johnson, Josie J. International Air Flights. Clinton Gilkie. ^ a b c Atwal, Glyn; Jain, Soumya (2012). The Luxury Market in India. Palgrave Macmillan. p. 102. ISBN 1-137-24317-1. ^ Moodley, Kiran. "Singapore's Changi Airport Named World's Best". NBC News. Retrieved 5 October 2014. ^ "World Airport Awards". Archived from the original on 21 September 2014. Retrieved 29 September 2014. ^ Eames, Jim (2000). Sydney airport: 80 years as the gateway to Australia. Edgecliff, N.S.W. : Focus Pub. ISBN 1-875359-64-8. ^ Gall, Jennifer (1986). From bullocks to Boeings: an illustrated history of Sydney Airport. Canberra: Australian Government Pub. Service. ISBN 0-644-03395-9. ^ "Word Travels: Overview of Santiago International Airport". Retrieved 4 October 2014. ^ "Word Travels: Overview of Prague Václav Havel Airport". Retrieved 4 October 2014. ^ "Word Travels: Overview of Budapest Airport". Retrieved 4 October 2014. ^ "Word Travels: Overview of Warsaw Airport". Retrieved 4 October 2014. ^ "Word Travel: Overview of Caracas Airport". Retrieved 4 October 2014. ^ "Word Travels: Overview of Kolkata Airport". Retrieved 5 October 2014. ^ "Word Travels: Overview of Bologna Airport". Retrieved 4 October 2014. ^ Peskov, Denis. "Naming of International Airports". Retrieved 2 October 2014. ^ "World Top 30 Airports". Fubra Limite. Retrieved 5 October 2014. ^ "Top 10 Airports: Passenger Traffic in 2013". Airport World Magazine. 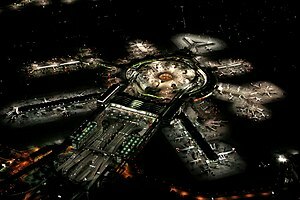 ^ "(LAX) Los Angeles International Airport Overview". Flight Stats. FlightStats, Inc. Retrieved 2 October 2014. ^ Sweeney, Chris. "The World's 18 Strangest Airports": Svalbard, Norway". Popular Mechanics. ^ Sweeney, Chris. "The World's 18 Strangest Airports: Dammam, Saudi Arabia". Popular Mechanics. Wikivoyage has a travel guide for At the airport. This page was last edited on 21 March 2019, at 03:26 (UTC).